For this post, I have put together a collection of the best utility knives currently available. Utility knives come in several forms including fixed blade, retractable and folding options. Depending on the task you are performing and the material you are cutting, some knives will be better suited for the task. For example, when box cutting, a blade that quickly extends and retracts to a fixed length is generally ideal. While for crafting, a blade with a variable length can offer greater flexibility. The following utility knives use the latest innovative components to meet your needs and help to ensure you do your best work. So here is my list of The 10 Best Utility Knives. 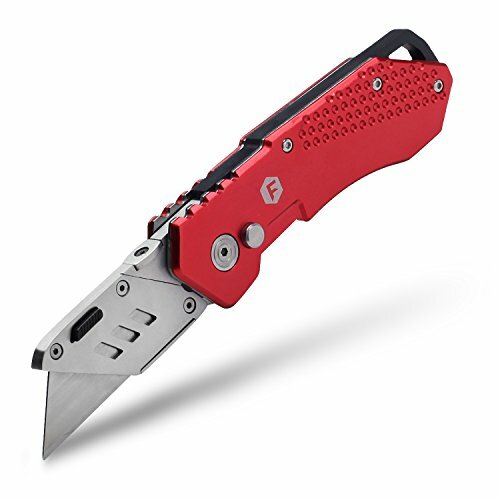 The FC Folding Pocket Aluminum Utility Knife is equipped with heavy-duty carbon steel blades, this utility knife is great for a variety of tasks, such as opening boxes, slicing rope, cutting wallpapers, carpets, cardboards and plastics. One button lock-back design locks the blade in place for safe and efficient cutting. Easy access button for quick blade change with no additional tools required. Accepts all standard size utility knife blades. Folds easily and fits in your pocket for quick retrieval. Made with high quality anodized aluminum and stainless steel, which is durable, lightweight, and rust-resistant. Ergonomic non-slip handle offers a secure grip and is comfortable to hold for a prolong period of time. Stainless steel clip allows you to carry it with you wherever you go. When open, the knife measures 6.6 inches, and it closes down to 4.3 inches. The Alltrade 150003 Auto-Loading Utility Knife offers very fast blade changes. Blades can be removed with the touch of a button. Squeezing a level on the handle loads a new blade in it's place. User comfort is assured by the ergonomic cushion grip. Six heavy-duty blades are included with each knife. The Gerber EAB Lite Utility Knife is comfortable to hold and easily pocketable. 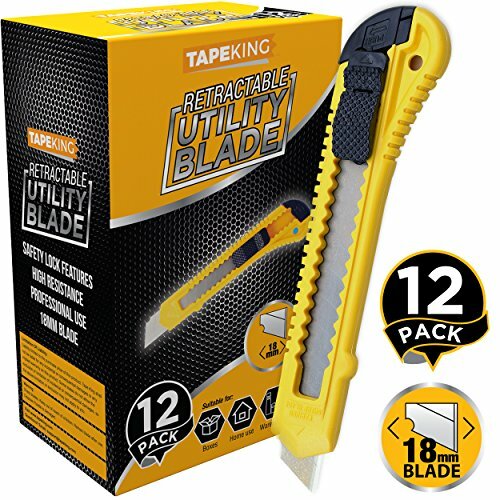 Features a utility blade that's replaceable with either 2-1/4-inch contractor grade or standard size utility blades. 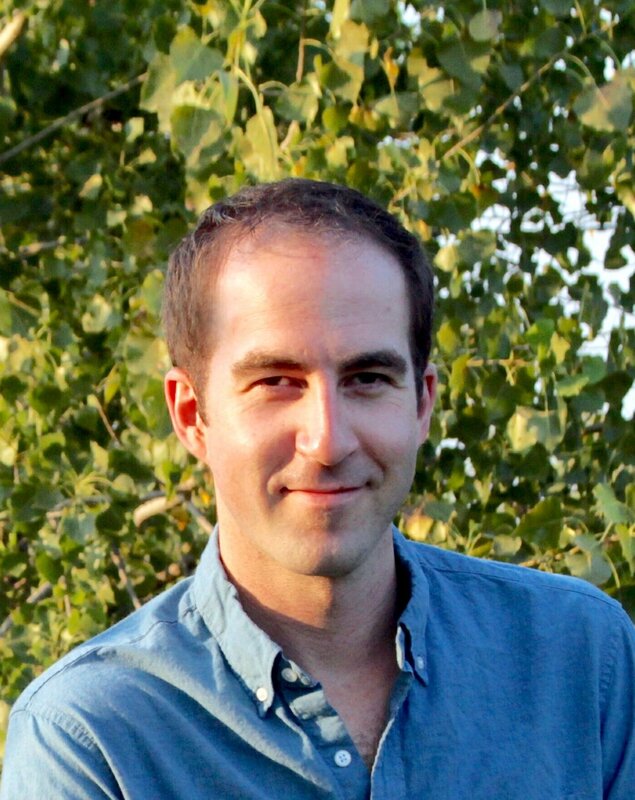 Tapered shape with rounded edges. Deep finger grooves that for a secure grip. When open, measures 5.1 inches, and it closes down to 2.8 inches. Lightweight at just 2.5 ounces. Don't forget the extra blades. The Stanley 10-099 Retractable Utility Knife has a three-position retractable blade made of carbon alloy steel that can handle all types of professional and home improvement jobs. Interlocking nose to hold blade securely. Includes three 11-921 Heavy Duty utility blades. 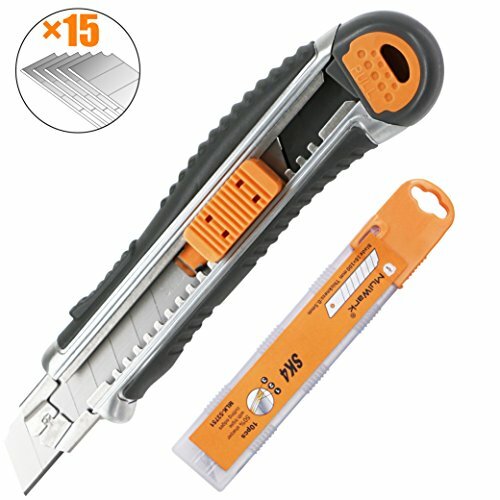 The 12-Pack Tape King Retractable Utility Knife Set is a lightweight, heavy duty tool. Cut and slice through packages, boxes, cartons, paper, plastic, packing tape, labels, stickers and more. Blade width is 18mm (0.71 Inches), it is thin, small, lightweight with comfortable grip and retractable blade. Snap-off blade allows for extended use through the guided line marks on the blade. Simply snap off the blade at the desired line marking, when it gets dull. Prevents blade slipping with the safety lock tab. 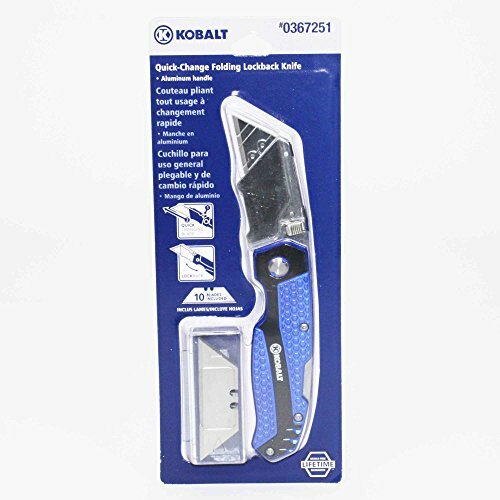 The KOBALT Utility Knife is made for easy and efficient cutting. Quick-change mechanism provides easy blade replacements, allowing you to switch them out as needed. Aluminum handle ensures durability and dependability. It comes with 11 blades, eliminating your concerns over rust or dullness. Includes 11 Blades: 1 Installed and 10 in a Safety Dispenser. 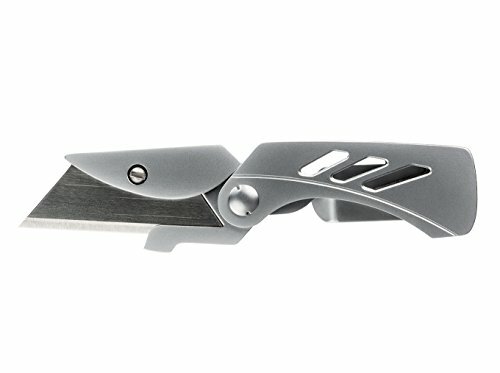 The Klein Tools Folding Utility Knife is an innovative and useful tool that combines the best features of a lock back knife with a utility knife. 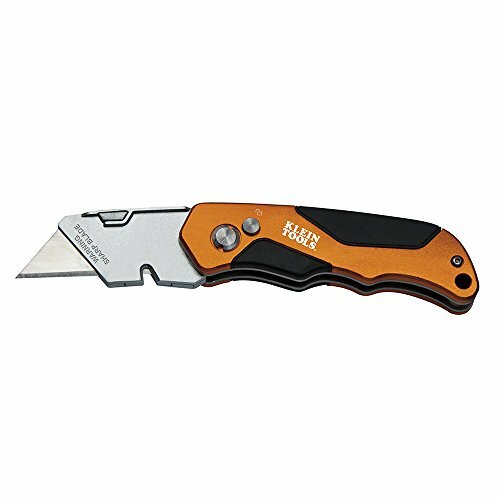 Features a sturdy aluminum handle with fold-out blade housing. Blade is changed easily using patented snap lock and sliding mechanism. High quality triple ground blades stay sharp longer. Blade release button for quick blade changes. Utility Knife + Box Cutter - All Purpose, Retractable | Multi-Position Blade, Lock-Back for Safety | 5 Sharp Blades with Storage in Non-Slip Handle | Ergonomic, Easy Grip Design Protects Knuckles! The Home Planet Gear Utility Knife is fully retracting and both heavy duty and light weight. Quick release and easy change blade with convenient refill storage built right into the handle. Variable position blade locks at: closed, 1/8" (tip), 1/2", 3/4" or 1" (full open). Ergonomic handle is easy to grip and comfortable to use. Protects your knuckles from cardboard, carpet and other rough surfaces. Handle allows for better control on precise cuts. 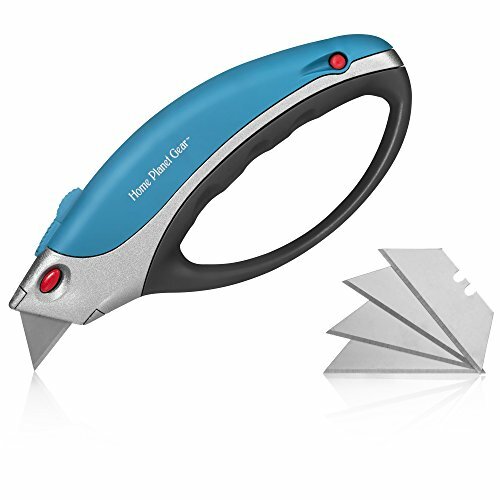 Uses standard utility knife refill blades and comes with five reversible blades.. 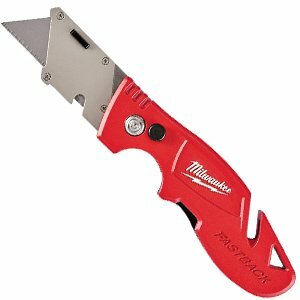 The Milwaukee 48-22-1903 Utility Knife is a lightweight, practical addition to your tool kit. Ergonomic design conforms to your hand in whatever position the blade is locked into, be it 45 degrees or straight ahead like a standard knife. Holds up to 4 extra blades with its onboard storage and are swapped as quickly as you can push the release button. Simply press down, pull the old blade out, and slide the new blade in. Features a hole for attaching to lanyards or a wire clip. MulWark Easy Loading Retractable Utility Knife features a heavy duty snap-off blade and an ergonomically constructed handle. Strong, ergonomic curved ribbing provides an accurate, comfortable, balanced controlled sure grip, and helps to prevent slipping. Stainless steel sliding track and blade casing chamber keep the blades locked in place. Auto lock feature prevents the blade from moving unless the slider is depressed. Comes with five shatterproof stainless steel blades that feature triple ground cutting edge. I hope this list of the best utility knives was helpful.